Public Works Administration (PWA), part of the New Deal of 1933 (renamed in 1935 as the Work Projects Administration; WPA) , was a large-scale public works construction agency in the United States headed by Secretary of the Interior Harold L. Ickes. It was created by the National Industrial Recovery Act in June 1933 in response to the Great Depression. It built large-scale public works such as dams, bridges, hospitals, and schools. Its goals were to spend $3.3 billion in the first year, and $6 billion in all, to provide employment, stabilize purchasing power, and help revive the economy. Most of the spending came in two waves in 1933-35, and again in 1938. Originally called the Federal Emergency Administration of Public Works, it was renamed the Public Works Administration in 1935 and shut down in 1944. The PWA spent over $6 billion in contracts to private construction firms that did the actual work. It created an infrastructure that generated national and local pride in the 1930s and remains vital seven decades later. The PWA was much less controversial than its rival agency with a confusingly similar name, the Works Progress Administration (WPA), headed by Harry Hopkins, which focused on smaller projects and hired unemployed unskilled workers. Frances Perkins had first suggested a federally financed public works program, and the idea received considerable support from Harold L. Ickes, James Farley, and Henry Wallace. After having scaled back the initial cost of the PWA, Franklin Delano Roosevelt agreed to include the PWA as part of his New Deal proposals in the "Hundred Days" of spring 1933. The PWA headquarters in Washington planned projects, which were built by private construction companies hiring workers on the open market. Unlike the WPA, it did not hire the unemployed directly. More than any other New Deal program, the PWA epitomized the progressive notion of "priming the pump" to encourage economic recovery. Between July 1933 and March 1939 the PWA funded and administered the construction of more than 34,000 projects including airports, large electricity-generating dams, major warships for the Navy, and bridges, as well as 70% of the new schools and one-third of the hospitals built in 1933–1939. Streets and highways were the most common PWA projects, as 11,428 road projects, or 33% of all PWA projects, accounted for over 15% of its total budget. School buildings, 7,488 in all, came in second at 14% of spending. PWA functioned chiefly by making allotments to the various Federal agencies; making loans and grants to state and other public bodies; and making loans without grants (for a brief time) to the railroads. For example, it provided funds for the Indian Division of the CCC to build roads, bridges and other public works on and near Indian reservations. 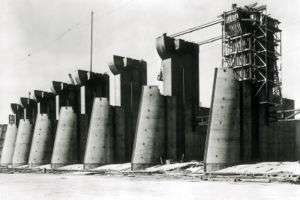 Fort Peck Dam in Montana; spillway construction. One of the largest dams in the world, it continues to generate electricity; in July 1936 its construction employed 10,500 workers. The PWA became, with its "multiplier-effect" and first two-year budget of $3.3 billion (compared to the entire GDP of $60 billion), the driving force of America’s biggest construction effort up to that date. By June 1934, the agency had distributed its entire fund to 13,266 federal projects and 2,407 non-federal projects. For every worker on a PWA project, almost two additional workers were employed indirectly. The PWA accomplished the electrification of rural America, the building of canals, tunnels, bridges, highways, streets, sewage systems, and housing areas, as well as hospitals, schools, and universities; every year it consumed roughly half of the concrete and a third of the steel of the entire nation. The PWA also electrified the Pennsylvania Railroad between New York and Washington, DC. At the local level it built courthouses, schools, hospitals and other public facilities that remain in use in the 21st century. PWA Project and Army Corps of Engineers Lock & Dam #10 construction. PWA Project and Army Corps of Engineers Lock & Dam #16 construction. The PWA was the centerpiece of the New Deal program for building public housing for the poor people in cities. However it did not create as much affordable housing as supporters would have hoped, building only 29,000 units in 4 1⁄2 years. The PWA spent over $6 billion, but did not succeed in returning the level of industrial activity to pre-depression levels. Though successful in many aspects, it has been acknowledged that the PWA's objective of constructing a substantial number of quality, affordable housing was a major failure. Some have argued that because Roosevelt was opposed to deficit spending, there was not enough money spent to help the PWA achieve its housing goals. Reeves (1973) argues that the competitive theory of administration used by Roosevelt proved to be inefficient and produced delays. The competition over the size of expenditure, the selection of the administrator, and the appointment of staff at the state level, led to delays and to the ultimate failure of PWA as a recovery instrument. As director of the budget, Lewis Douglas overrode the views of leading senators in reducing appropriations to $3.5 billion and in transferring much of that money to other agencies in lieu of their own specific appropriations. The cautious and penurious Ickes won out over the more imaginative Hugh S. Johnson as chief of public works administration. Political competition between rival Democratic state organizations and between Democrats and Progressive Republicans led to delays in implementing PWA efforts on the local level. Ickes instituted quotas for hiring skilled and unskilled blacks in construction financed through the Public Works Administration (PWA). Resistance from employers and unions was partially overcome by negotiations and implied sanctions. Although results were ambiguous, the plan helped provide African Americans with employment, especially among unskilled workers. When President Franklin D. Roosevelt moved industry toward World War II production, the PWA was abolished and its functions were transferred to the Federal Works Agency in June 1943. The PWA should not be confused with its great rival the Works Progress Administration (WPA), though both were part of the New Deal. The WPA, headed by Harry Hopkins, engaged in smaller projects in close cooperation with local governments—such as building a city hall or sewers or sidewalks. 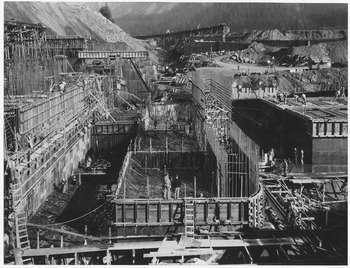 The PWA projects were much larger in scope, such as giant dams. The WPA hired only people on relief who were paid directly by the federal government. The PWA gave contracts to private firms who did all the hiring on the private sector job market. The WPA also had youth programs (the NYA), projects for women, and arts projects that the PWA did not have. ↑ National Archive. "Records of the Public Works Administration". 135.1. ↑ Nick Taylor, American-made: The enduring legacy of the WPA (2008). Clarke, Jeanne Nienaber. Roosevelt's Warrior: Harold L. Ickes and the New Deal. 1996. 414 pp. Graham, Otis L., Jr., and Meghan Robinson Wander eds. Franklin D. Roosevelt, His Life and Times. New York: Da Capo Press, 1985, pg. 336-337. Leuchtenburg, William E. Franklin D Roosevelt and the New Deal. New York: Harper & Row, pg. 133-34..
Wikimedia Commons has media related to Public Works Administration.